750-857 is a nonindustrial world, that requires extensive imports of outside technology to maintain a modern, star-faring society. It is a member of the Third Imperium in the Diamond-Prince Subsector of Ley Sector in the Domain of Gateway. Also known locally as the Hansen's World (world) system. 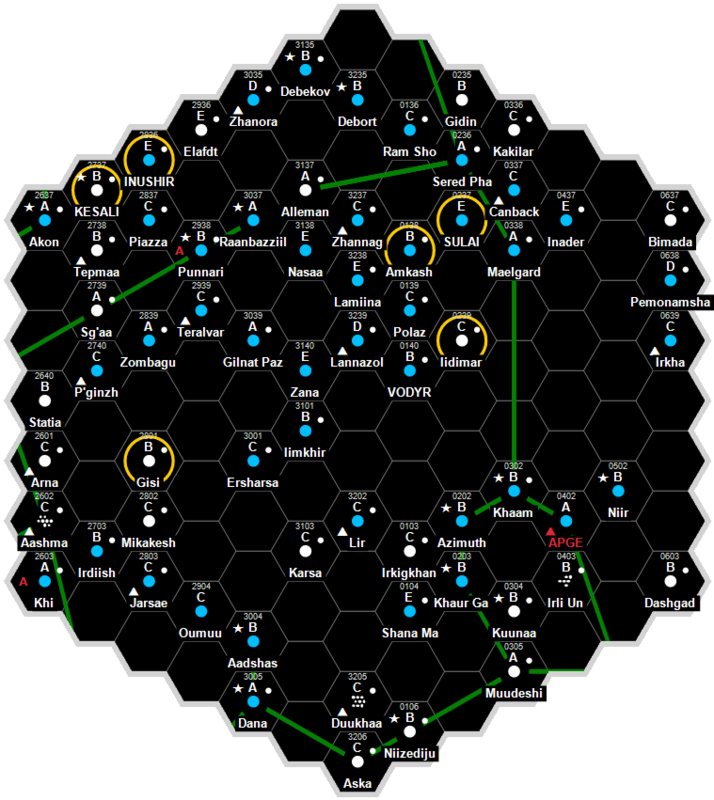 Primary Star: G0 V Star 750-857 forms a somewhat unremarkable star system on the backwaters of the Serpent Main in the Diamond-Prince Subsector of Ley Sector. The mainworld, Hansen’s World, lies in the third orbit about the lone yellow, almost orange main sequence star. A small rocky furnace of a planet can be found in the first orbit around the star, while at the farthest edges of the system in far orbit, is a small barren planet thought to be a rogue that was caught by the gravitational pull of the nearby star. Gas Giants: 3 Two large gas giants dominate the star system. The largest, Torment, circles its star’s 7th orbit and has 5 smaller satellites in orbit around itself. The smaller (by only a narrowest of margins) is the sister giant, Terror in the 8th planetary orbit. While smaller, Terror has attracted a total of 9 natural satellites within her own orbit. A much smaller gas giant known as Fear is found in the unusual position of the 4th orbit around the star. Fear has a dense set of rocky rings in orbit around her, but nothing that qualifies as a natural satellite. Planetoid Belts: 1 A somewhat recent (in stellar terms) event, the planet that once occupied the 2nd orbit around the star was eventually drawn into a colliding orbit with the small gas giant Fear some 40,000 years ago. The remaining planetary debris has formed both a ring around the gas giant itself and a fairly dense planetoid belt in the 2nd orbit. The mainworld, Hansen’s World, lies in the third orbit about the lone yellow, almost orange main sequence star. 750-857, as a member world of the Third Imperium has a member of the Imperial Nobility overseeing the world. 750-857 has a frontier quality starport. 750-857 possesses a Technology Level of TL–4. 750-857 has a Representative Democracy government. This page was last modified on 31 May 2017, at 17:59.